Assassin’s Creed Odyssey will offer players more choice than ever, according to its makers. For the first time, it allows players to choose between being a female or male assassin, and to control characters’ conversations. “We wanted players to make the experience their own,” says narrative director Mel MacCoubrey. The latest game in the franchise has been unveiled at the E3 gaming expo in California. It is due to be released in October this year on Xbox One, PS4, and PC. Like its predecessors, Assassin’s Creed Odyssey is set in an historical world – this time it’s Ancient Greece in the year 413 BC. “It’s a world of contrasts,” Mel tells Newsbeat. She and the team have developed a new interactive dialogue system which allows players to control how characters interact. “For the first time you can lie to characters, be aggressive to characters, or even be romantic with them,” says Mel. Characters include the real-life Greek philosopher Socrates, meaning players can have “a conversation with history as never before”. “We’ve had to do a ton of research to know these historical figures inside out,” explains Mel. 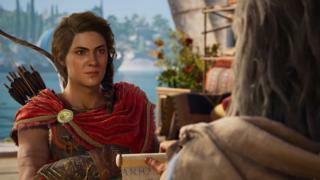 And players will be able a choose between being a man called Alexios or a woman, Kassandra. “It’s an equal opportunity game,” says Mel.